I finaly got the chance to get this table completed. I didn’t like the way the legs looked, so I decided to add gold leaf to them. Made a big difference. The table looks much better with it. I used an imitation gold leaf, since I had some on hand. It looks good. 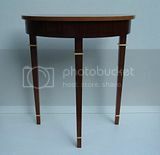 This is an outstanding table, beautiful ,just exquisite ,It sure shows your high level of woodworking expertize. Nice touch lee. I had completely forgotten about how good a touch of leaf can be. Perfect solution to a leg that’s getting a bit long. It’s something I forget about too. As usual – beautiful work Lee. thanks for posting. always nice to see such work, and always nice to see what you’re working on. 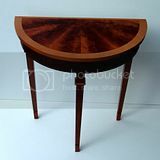 That little table turned out beautifully, Lee. And you’re right.. the gold leaf was the perfect touch to set it off. Very attractive. And your top fanned pieces are perfect. Thanks for sharing that! Beautiful table. Nice job on that baby. Great Table Lee, that gold leaf looks great. It’s the little touches like that gold leaf that turn a very nice table into a great table, I’m still trying to learn those little things,thanks for another lesson. Do you add the leaf after you put the finish on or is it done before. Real nice table Lee .Excellent workmanship. Thank you. The gold leaf is put on after the finish, but before the final coat of lacquer. (Between coats), That way it won’t tarnish. Thank you wchips and Matt.